Pricebusters Saving Your Hard Earned Money: Taking Pictures and Posting on Instagram Saves us $1377.09 in 4 months! Taking Pictures and Posting on Instagram Saves us $1377.09 in 4 months! I post a lot on Instagram these days. It's so easy, and instantaneous. I don't have to have enough space to upload my pictures, or deal with text that's wonky. I can share deals instantly and with pictures! But, once in awhile I have more to say than can be properly featured in a quick Instagram post. This is one of those times. If you have read this blog for awhile now you know there are some sure fire ways to decrease your grocery spending. This may not be an exhaustive list, but it's a start. The latest thing to add to the list is photo groceries. To become more conscious of where your grocery money goes resolve to take pictures of everything that comes into your house for one month. At the end of the month you can, if you so choose, arrange this into a nice collage. ( I use picmonkey and befunky). Why would you do this you ask? Well, here's my story. 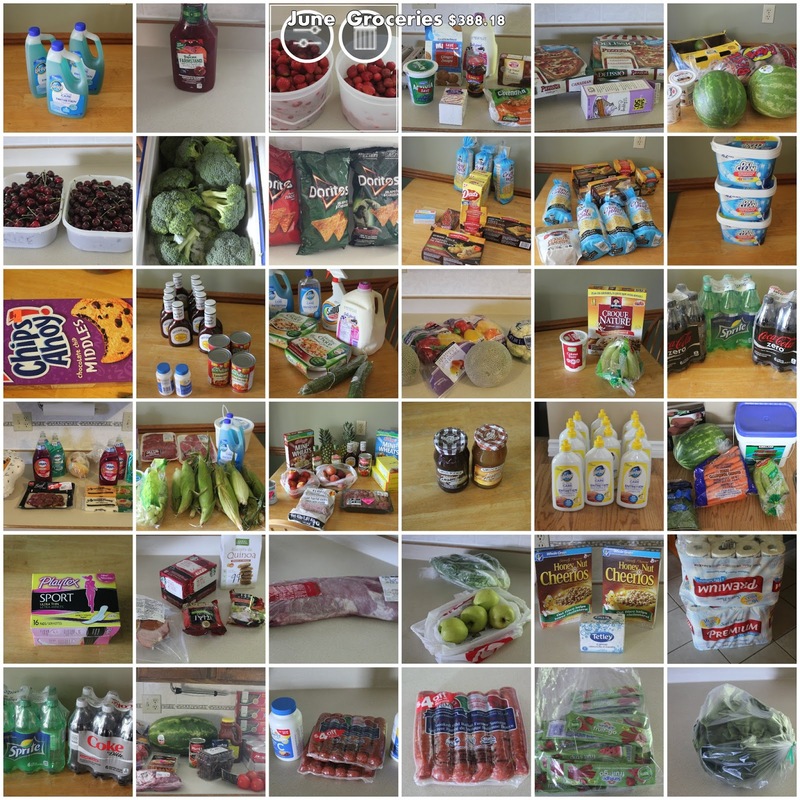 In April of this year I decided to start posting a collage of our families grocery purchases each month. At the beginning of the year I had budgeted a lot more for groceries as I found last year I was having trouble staying on budget. We feed a family of 4 with our youngest being a 15 year old boy, my husband has Celiac disease and my daughter avoids gluten and milk products. The first 3 months I was pretty much on budget. April I decided to really keep an eye on things and be more creative with sale items. Since then our grocery spending has been pretty much half of our allotted budget! The accountability of posting so everyone can see has been a bonus for me! Because of the excess we were able to buy a new to us hot tub! (ours was on it's last legs). See my Instagram for that whole story if you are interested. So, what easy steps can you take? Maybe just starting by keeping a running tally of your grocery spending? I keep all the months receipts in an envelope marked August. On the front I tally up the spending weekly as I shop. At the end of the month I add up each stores receipts to see how much I spend at each store. Maybe a second step the following month could be to start getting in the habit of taking pictures of your purchases. I try to make sure our kitchen table is cleaned off before I shop so that upon arriving home I just place the items there quickly and take my pictures. I usually separate by store, but this is totally not necessary. The third month you could make your collage. It's quick,easy and free with Picmonkey or Befunky. In the end by being more conscious you will find you'll spend less. You'll also have a neat way to go back and track when items cycle throughout the year. 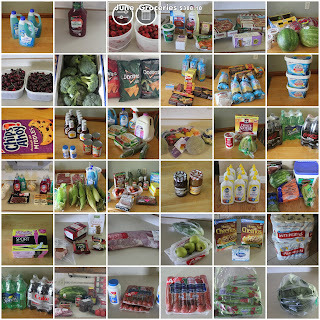 I just make a separate folder for each month's grocery pics on my computer and then toss them all into This Year's Groceries folder at the end of the year. From April to July end we have shaved $1377.09 off our spending!